During the cold season, I get in the habit of drinking healing herbal tea in the afternoon. It’s a great way to ease digestion, calm and focus my mind, stay aware and include some extra nutrients in my diet. If you’re having your afternoon tea at the office, this drink is just what you need. You can enjoy the refreshing taste of rosebud and mint while sipping away work stress and ignoring those less than tolerable co-workers who make getting anything done a challenge. Mint tea has been used for years in the alternative medicine world for all kind of health issues. I like to buy my tea from trusted sources that respect the plant and its life cycle, or pick up the mint from the farmers market and dry it myself. You can taste the difference between a cheap bag packed tea and the organic ones from companies who understand that the health benefits of the plant can be destroyed by improper handling, storing and packaging. We have to respect nature’s free medicine to get the benefit from its healing gifts, and herbs are definitely worth giving the extra attention! During summer, I use the freshly picked herbs that I grow in flower pots on my balcony. I grow them with a lot of love, appreciation, and respect for everything they have to offer. Mint is a favorite tea in our house, so I grow my own herbs and dry them, but also buy quality organic tea to prepare my afternoon drinks with. The health benefits of mint come from its essential oil, which has exceptional healing properties. Mint has been used to fight and prevent cancer, provide digestive relief, reduce inflammation, fight off infections and reduce stress. It has an incredibly refreshing flavor and smell that is perfect for calming the mind and promoting awareness. So the next time you’re struggling during a mid-afternoon slump or food coma, grab a cup of this tea instead of coffee to keep you focused. Not bad, eh? 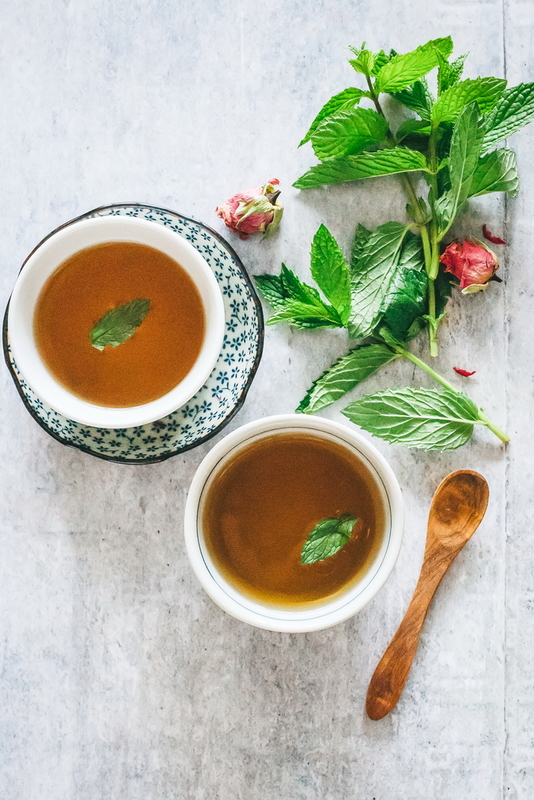 You could literally drink peppermint tea by itself and see tons of health improvements, but adding in rosebuds to your afternoon delight really seals the deal. Rosebuds are an excellent source of vitamin C, which is ideal for improving skin health, improving collagen production, and reducing wrinkles. Vitamin C is also needed to fight off free radicals that cause disease and inflammation, protecting you from everything from the common cold to bigger, scarier diseases like cancer. 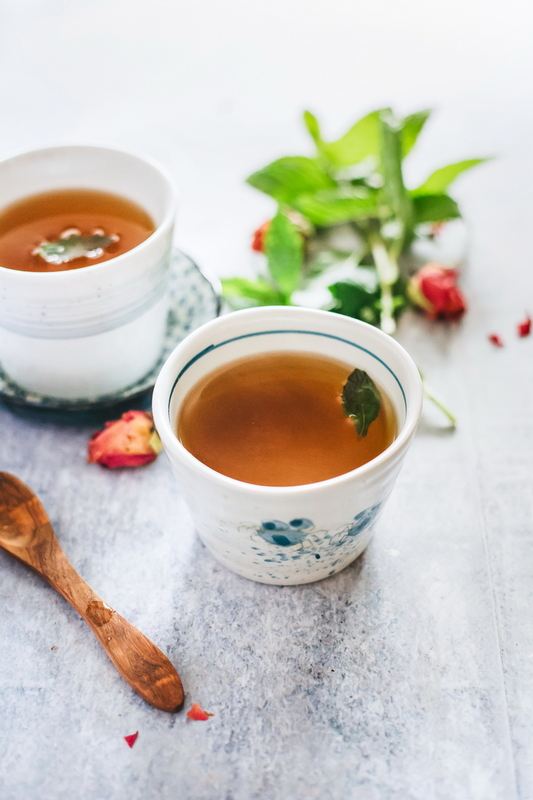 Rosebud tea is also high in polyphenol antioxidants called catechins that contain EGCG, which is commonly found in green tea and has been shown to kill cancer cells and inhibit the growth of dangerous tumors without hurting nearby healthy cells. I like to combine strong flavors with mild ones in my afternoon teas while also ensuring that the herb properties complement each other. 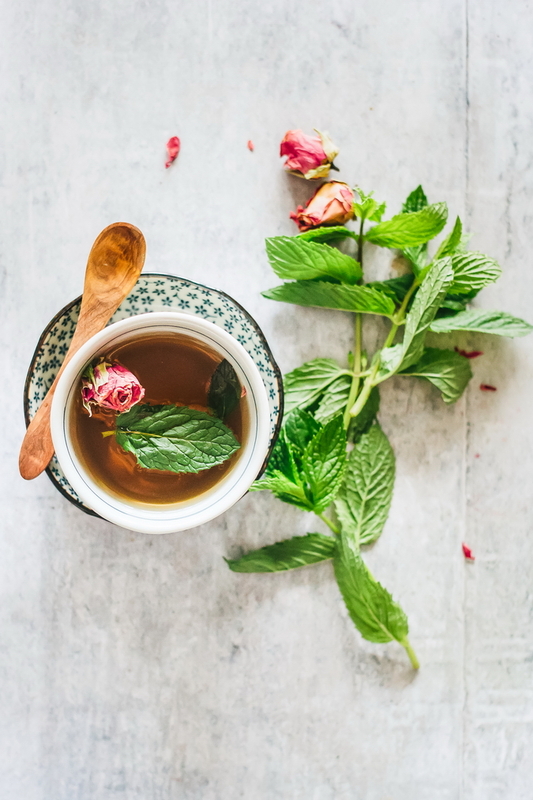 Rosebuds are the perfect match for mint because they have stress reducing properties while also containing a significant amount of caffeine to stimulate the central nervous system and improve concentration levels. Rosebuds also have soothing digestive properties to help you settle your stomach after a big lunch or anytime you feel nausea coming on. Bring water to a boil then pour over the rosebuds and peppermint in a kettle. Infuse for 7 minutes, then strain and drink warm, sip by sip. Can You Detox from Drinking Plain Green Tea? Does Detox Tea Help You Lose Weight? Ana is a healthy recipe writer, food photographer, yoga enthusiast and soon-to-be certified nutritionist. She is inspired by whole, healthy ingredients that she uses in her clean eating recipes and her photography captures their vibrant splendor using natural light. Smoothies, juices, salads, soups or wraps – eating should help our bodies detox naturally and heal all the diseases associated with toxin burden. She believes in the concepts of healing and detox through naturopathic nutrition. A healthy detox means restoring the natural cells environment, enabling them to replenish with oxigen and nutrients from fresh, organic foods.